Poor Calvin. He doesn’t think a day where you have to take a bath & go to bed early counts as a proper day off. Hobbes on the other hand appreciates the ka-pow color changing of the leaves & the brisk air. 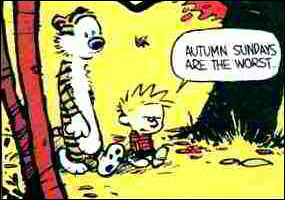 I think tomorrow…I’ll be Hobbes.